Mobile home for 1-6 people (sleeping), 8 seats with seatbelts (seating), with two very comfortable 170 cm wide beds. Kitchen, table, webasto oil heater, sink with running cold water, two gas cookers, plates, cups, knives, forks, spoons etc. for 6 persons and a fridge-freezer. Included in the price: kitchen appliances, duvets and pillows + sheets for the bed, blanket, cleaning materials, 6 camping chairs and a table. The van is in good condition and is really well maintained. 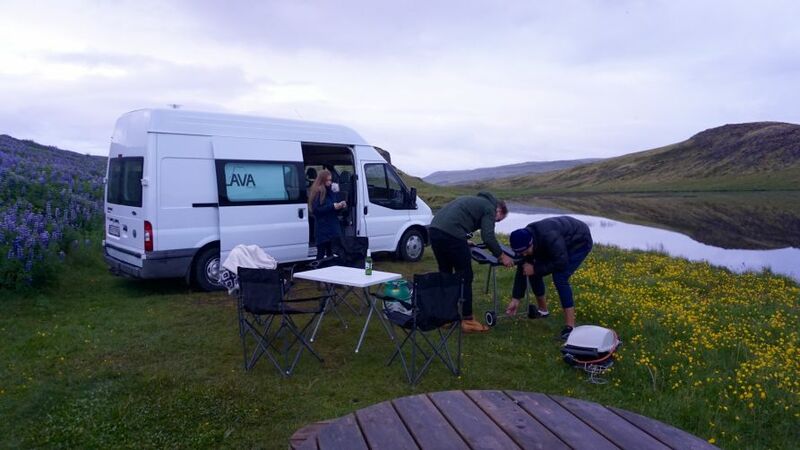 Take flybus from Keflavík airport to BSI Reykjavík bus station to pick up the mobile home. Drop-off is also at BSI bus station unless other arrangements have been made. Pick-up and drop-off at KEF airport is optional for 10.000 ISK each way, let me know in advance. If the van is returned "really" dirty you will be charged extra 10.000 ISK. The van was very comfortable and it allows us to travel to many beautiful places. We recomend it ! Magnus and Daniel were great and the camper van was perfect for our trip. Would not hesitate to use them again and will be doing so next trip back. Spacious and nice car to travel Iceland by. Owner communicative and uncomplicated.